1. Starting on KETUBAH, click on images to see details. When you click on an image, you will find details about the designs, recommendations for what size to choose, and prices. After clicking on an image, see prices by selecting your options. The price can be seen under the name of the ketubah, at the top of the description. Because tastes differ significantly, I can't tell you what you will be happiest with. I can say that if you can't decide, you won't go wrong with paper or mounted paper. The canvas and metal options are high quality and good choices, but not everyone likes them and they can be difficult to sign, especially if the signatures are against a dark background. If it were me, I would order the paper. For detailed descriptions of each option, see Materials. Font size is the determining factor for the size recommendations given for each design. The size recommendation is determined by using roughly 600 words total in both languages. However, size preferences are very subjective. What is "too small" for one person, could be "too big" for another. If in doubt order the size you would prefer and ask for a real size sample with your visual proof to print. If it is not suitable, we can upgrade (or downgrade) with no problem. Choosing a text that suits you and your relationship can be tricky. Whatever you choose, please make sure to run it past your rabbi if you are having a religious ceremony. If you purchase "Adding in Names & Dates," you can also customize the texts to your hearts' content - change wording or use an entirely custom text. 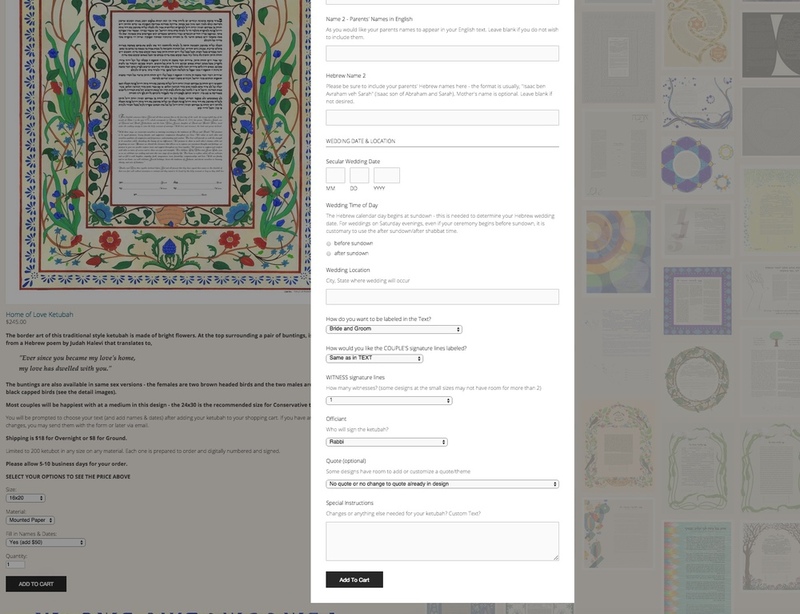 If you are not having your ketubah personalized, you only need to include your email address and click 'add to cart' when you see this screen. Even though it is a long list, you may skip filling it out by scrolling all the way to the bottom and clicking 'add to cart.' The only thing you must include is an email address so that I can contact you. Please note that clicking 'add to cart' at the end of the form is necessary to confirm your order and will not duplicate your order or result in extra charges. No matter how nice your rabbi's handwriting is, having them fill in your ketubah just doesn't look as nice as having your text completed by the artist. To see what is needed, add any ketubah to your cart. The order form will pop up. In addition to Names & Dates, couples can customize signature lines, change wording, add in custom quotes, and many other options. Every ketubah ordered gets at least two proofs: a text proof to make sure it says what you want it to say, and a visual proof to make sure you are happy with how it appears. After both proofs are approved, your ketubah will be printed to order. 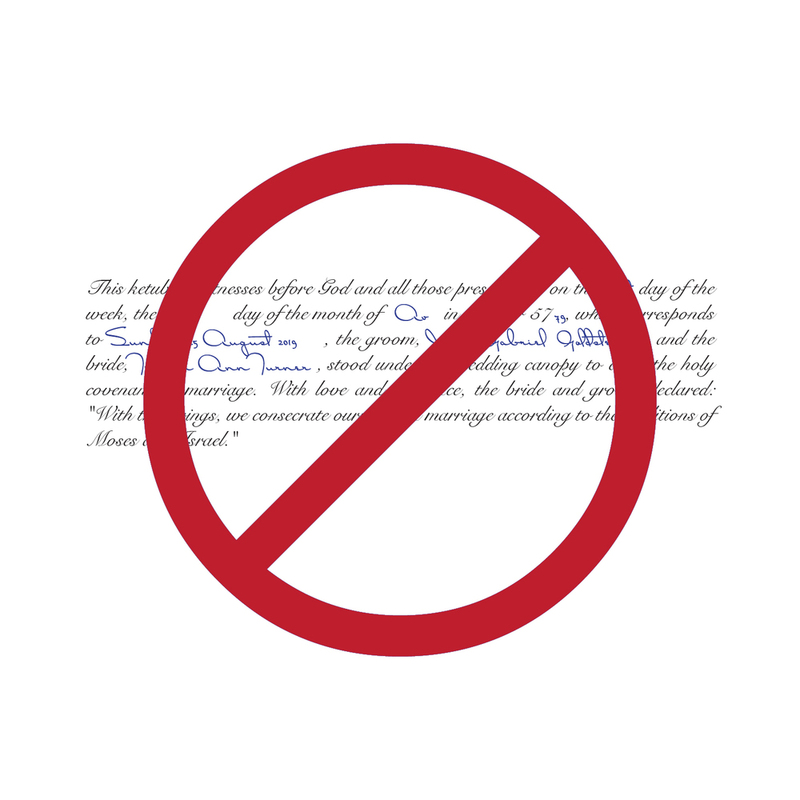 Because it can be a little overwhelming when you first see your ketubah, it is extremely easy to overlook text mistakes. To help couples avoid this pitfall, I provide a text only PDF, showing your text in plain fonts with easy-to-read information from your order form, answers to common text questions, comments and questions on the info provided. After this document is approved by the couple, we move on to the next stage. This is basically a Print Preview. It comes via email as a screen resolution JPG. Your approved text is pasted into the formatting, then tweaked for justification, size, balance, etc. Once you have approved your Visual Proof, I recommend asking a knowledgeable Jewish friend (rabbi) to look over both proofs. Involving them once you are satisfied means that they don't need to re-proof as you decide to add in middle names or correct your mother's Hebrew name, or make small changes in the wording. Ginny Reel is the artist behind Ketubah-Arts and will be the person who prepares your ketubah, answers all your questions, and makes sure you love your ketubah.